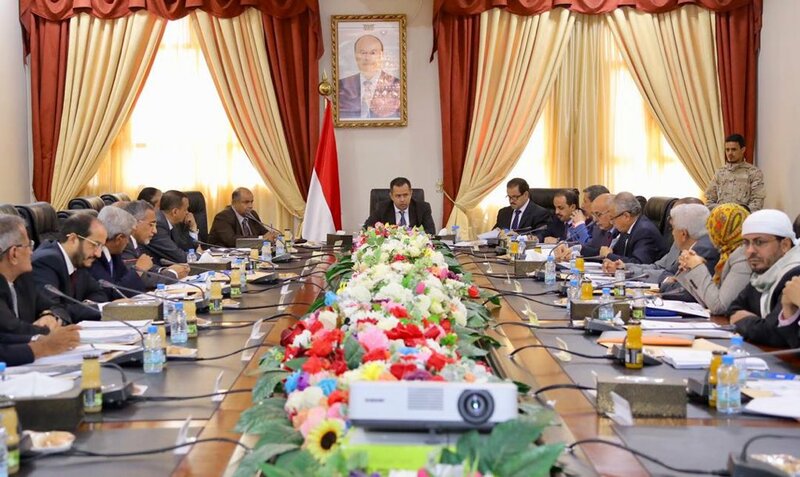 The head of the internationally recognized government of Yemen, PM Dr. Maeen Abdul Malik, said his government "will work in the coming days to resume production, refining and export of oil from new oil fields." "Oil and crude exports will support the central bank's cash reserves and restore the bank's cash cycle, which will directly contribute to the bank's control of the banking market and reduce speculative operations, which the tellers use illegally. ", Hadi's prime minister said on Thursday in his first meeting in the interim capital of Aden. "Even today, the economic treatment of the collapse of the local currency, which reached its lowest level, is still insufficient. The difference between the price of the Central Bank of Yemen and the price in the parallel market is 170 riyals, which is about 28% of the value of the currency and this is directly reflected on Yemeni citizens." Government-run "Saba" news agency reported. He stressed that the government should work to reduce the difference, until the local currency rate as determined by the bank, and the monetary policy in the hands of the central bank instead of speculation in local currency in the parallel market. The government affirmed the need to reach out to the brotherly and friendly countries to secure financial deposits with the central bank, to increase the export of oil and to start exporting gas to secure renewable financial resources for the government in the central bank, . It also stressed the speed of research with the Central Bank on mechanisms to finance the budget from non-inflationary sources. Yemen is a small oil producer with proven reserves of about 3 billion barrels, according to the US Energy Information Administration. Yemen produced about 500,000 bpd before the war, more than half of which came from Hadramaut province in the south. The economic file is one of the challenges facing the Yemen`s internationally recognized government, which recently returned to the city of Aden to conduct its work from within the country. The Yemeni economy has witnessed a rapid collapse since mid-June as a result of the continued deterioration of the local currency "riyal" to frightening levels, which caused the suffering of the living people and the escalation of the situation of anger on the street in Yemen. Despite the government's efforts to stop the deterioration of the Yemeni currency, all the measures it has taken have not been able to stop this deterioration amid accusations from many parties to the government of corruption and impotence, which further predicts the decline of the Yemeni riyal. The riyal's collapse against the dollar continues despite the Saudi grant, announced by Saudi Arabia in early October, to provide $ 200 million in grants to the Central Bank of Yemen, in support of its financial position.